When a black man was elected president of the United States, it seemed that a thick barrier had been destroyed which had marred American life for many years. Progress in relations between the races in this nation had apparently come to the point where white people were not unwilling to vote black people into high office. It appeared to be a break-through. However, distrust and anger over race matters have clearly worsened since 2009. Who can deny it? Some of the problems come from confusion over the issues of race, with faulty ideas gaining favor with passionate people “on both sides.” The situation is dangerous as well as distressing, but there is a solution to it in the Bible. Jesus said, “Thy word is truth” (John 17:17), and since God’s Word always tells the truth, we can get help from the Bible to clear up our thinking. Let us learn or re-learn five facts about the subject of race in order to help ourselves and our countrymen get past this unhappy and unnecessary strife. NOT EVERYTHING THAT IS CALLED “RACISM” IS REALLY RACISM! Originally the term “racism” had a much more specific meaning than it does in common usage today. 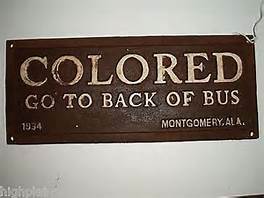 A racist is a person who believes that certain people’s actions and habits are determined by their “race.” Flaws in character as well as admirable characteristics are rooted in the D.N.A., and genetic causes for good and bad are carried in races. Racist views are those that were propagated by the Nazis and by the Ku Klux Klan. Racism is an ideology; it is not just unkindness or prejudice toward people of a different color or belonging to a different race. Lack of love for anyone is wrong according to God’s “royal law” (James 2:8-9), but not all unloving words or actions constitute racism. The reason this distinction is important is that more and more voices today are making the claim that racism is rampant in this country, and that something radical must be done about it. The fact is that true racism, although more available to more people because of the internet, is considerably less influential and widespread than it was even fifty years ago in America. When certain famous people were recently punished for using an unkind racial slur, they were accused of racism. But there is little evidence that they actually espouse Klan or Nazi doctrine because they used the hurtful word. Seeming mistreatment of anyone because of racial bias is called “racism,” although it really isn’t. It is unchristian and unkind, but it isn’t racism. Racist ideas have been spread for many years, and prominent leaders have espoused and propagated some of them, but every kind of racial bias or unkindness is not racism. ETHNIC PREJUDICE AND PREFERENCE IS ALMOST UNIVERSAL. The truth is sad, but it is the truth, that preference for one’s own group is an almost universal human characteristic. You find it on any continent and in every country. Most people favor the group they perceive as the one to which they belong. Right or wrong, it is a fact. To set the goal of wiping out racism in the United States, while defining racism as preference for one’s own perceived ethnic group, is to aim at an unreachable target and to excuse the rapid and unwarranted spread of government power. It can also be the means of fomenting further racial hatred and violent behavior. Although prejudice is not Christian, and racial bias is hurtful and ugly, they will not be eradicated by mobs or laws. PREJUDICE AND RACISM CAN ONLY BE CURED BY GOD. The royal law, “Thou shalt love thy neighbor as thyself,” is God’s law (James 2:8) and it can only be fulfilled when God’s love enters the human heart. The Source of love is God, and God is love. He sent His love to sinful man by sending His Son to be our Savior. Those who receive Jesus, also receive love into their lives. This is how the hatred in human nature is counter-acted. Before regeneration (the experience of being born again), a man is prone to hate. “For we ourselves also were sometimes foolish, disobedient, deceived, serving divers lusts and pleasures, living in malice and envy, hateful, and hating one another. It is a great change when a person is born again, regenerated, and renewed by faith is Jesus Christ, and it is the only change that can combat hate. Insisting that wrongs be righted, that we must be treated with respect, or that racial injustice must be punished seldom rises out of love for others, and often engenders hate. The Bible teaches us to think about things that are true, honest, just, and pure (read Philippians 4:8) in order to maintain peace of mind, but we are constantly reminded of wrong, impure, dishonest, and unjust things that have been inflicted upon our perceived group throughout history. And such thoughts create outrage and anger in our hearts and minds, to our detriment. This is how black people, women, Muslims, Mexicans, and Native Americans are being taught to think, and the regular reminders of injustice only bring more hate. It is God that puts love into hearts. When we have been “justified by faith, we have peace with God through our Lord Jesus Christ,” and “the love of God is shed abroad in our hearts by the Holy Ghost which is given to us” (Romans 5:1-5). THOSE WHO HAVE BEEN FREED FROM SIN CAN OVERCOME HATE. The New Testament speaks of a life of liberty that is experienced by the believer in Jesus Christ (see John 8:30-36). Jesus not only saves men from Hell, but also from their sins, including the hatred in the human heart. Colossians 3 is a passage of scripture that says the Christian is “risen with Christ” (verse 1), that “Christ…is our life” (verses 2-4), that “the new man…is renewed in knowledge after the image of him that created him” (verses 9-10), that “Christ is all, and in all” (verse 11), and that “charity [love]…is the bond of perfectness” (verses 12-14). Jesus breaks the chains of sin and hate, and brings love into the life of one who trusts in His salvation. No political or ideological movement or revolution can do that. His love in the heart breaks down the barriers of prejudice (read Colossians 3:1-14 again). JESUS CHRIST IS THE ANSWER FOR HATE AND THE AUTHOR OF LOVE. So Colossians 3 concludes that in Jesus Christ the distinctions of ethnicity, class, race, or group, no longer mar the love in the family of God, but instead “Christ is all, and in all” (read verse 11 again). We are no longer “Greek nor Jew, circumcision nor uncircumcision, Barbarian, Scythian, bond or free.” It is amazing how revived Christians get along! The need of our nation is not a renewal of old racial offenses, but rather a revival of the Christian religion. Evangelical revivalism turned the tide of American opinion against slavery in the nineteenth century, as it also did in England in the previous century. The love of God and not angry agitation will be the cure to our racial problems, and will give racial harmony a deep and practical application on a personal level in every town and community. Let the Gospel of Jesus Christ be preached, and the love of Christ be lived and spread by those who believe in Him!